Wyman Vertical Pianos: the Wise Choice! Wyman vertical pianos come in an exciting array of quality styles and finishes to meet every need, from practical designs and small entry-level instruments to larger professional studio upright models. The Wyman polished finishes are as durable as they are beautiful, adding beauty and style to any décor. The new Wyman American Designer Collection models feature beautiful satin finishes in popular sizes and designs for todays casual American lifestyle. Home - the best place to be with your new Wyman vertical piano! Wyman instruments are made exclusively from the finest materials to provide you and your family a lifetime of musical enjoyment. 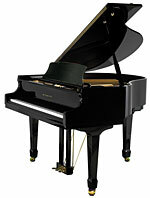 Wyman Grand Pianos: the Wise Choice! Model WG145  4' 9"
Model WG160  5' 3"
Model WG170  5' 7"
Model WG185  6' 1"
Wyman grand pianos offer classic grand styling in a number of popular colors and finishes. Wyman grands provide quality grand piano performance typically found only in grands that cost much more, delivering on the Wyman promise of quality and value! Wyman CD Player Pianos: the Wise Choice! This CD Player Piano System is a new addition to the Wyman product line-up, available as an option on all Wyman grand piano models. DSP based auto-calibration, true reproduction of expression levels, and improved note repetition are among the notable innovations that set Wyman CD apart from traditional player piano suppliers.